This book is a student handout for the course detailed below. The instructor PowerPoint slide show and samples of the handout and PowerPoint slide show may be purchased through www.eh.com.au. 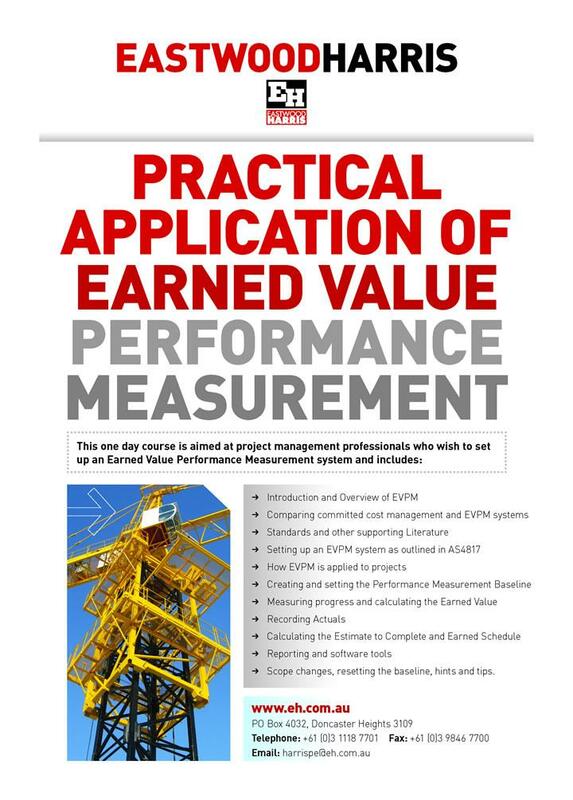 Why projects and organisations benefit from an EVPM system. An overview of current standards including AS4817 on which the course is based. Practical advice on how to set up, run and report an EVPM system. It includes advices on how to collect EV data from existing corporate systems, a subject often omitted in other EV courses. The course is presented in one day using a PowerPoint presentation and includes workshops at the end of each module and a copy of AS4817. Scope changes, resetting the baseline, hints and tips. A PowerPoint presentation of approximately 120 slides. A course handout with the slides, workshops and explanatory notes.